As part of our ongoing series of writing workshops, bestselling author Laurie Halse Anderson taught a writing class last week at Open Book Bookstore. Halse Anderson, who is known for her bestselling children’s books, from the raw and powerful young adult novel Speak to the historical middle grade books Fever 1793 and the “Seeds of America” trilogy to her children’s picture books, focused this class on adult writers, offering to answer any and all writing questions! Her advice was both practical, exhorting us to write for at least fifteen minutes every day, to spiritual, offering ways to manage the ever-present inner editor who tries to do us in. Halse Anderson described her belief that a big part of the writing process is learning to “sit in discomfort.” She explained that when kids, for example, say that they hate writing, what they mean is “I hate the way it makes me feel,” i.e. “I’m not good at it.” Adults struggle with this discomfort as well. But we have to sit with it, not avoid it. That’s the only way to push through. It’s so easy, she said, to rationalize not writing; it’s doing it that’s the challenge: making time for it, taking your own dreams seriously. Never feel that you are being selfish, Halse Anderson encouraged the writers in the room. Give yourself time, space, and permission to write. By the end of the workshop, attendees had a blueprint for moving forward with their writing projects, whatever genre they were working in, and whatever stage their work was in. 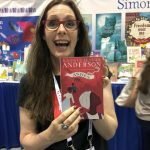 Halse Anderson, whom we are proud to call a local Philly writer, was generous in sharing encouragement and stories from her own writing life to illustrate ways to overcome struggle with determination. To hear a writer with her track record of success open up and talk about both the struggles and the methodology of writing was refreshing and inspiring!